As the Network Creator or Administrator, you can control how Ning Apps display on your social network. To change where a Ning App is placed on the main page, go to the My Network / Manage page and click the “Features Layout” link. From here, you can drag the Ning App to wherever you like in the center column of the main page. Because of the way they are designed, Ning Apps currently must be placed in the center column of your social network. 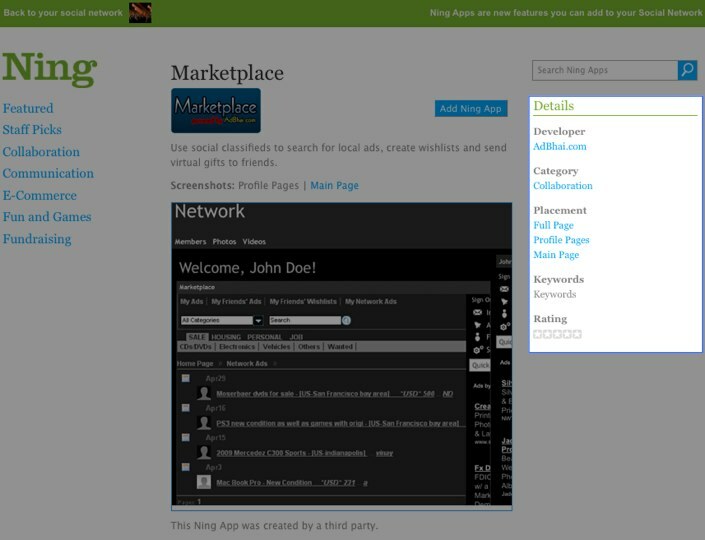 Use the Tab Manager to customize how your Ning App appears in a tab. If you haveÂ several Ning Apps on yourÂ social network,Â consider using sub-tabs to make navigation easier. To remove the app from the main page of your networkÂ without removing the app entirely from your network, click on your My Network tab to get to your dashboard. Then click on the “Features Layout” link to access the Features Layout management page. Drag and drop your Ning App into the “Drag Here to Remove Feature” section of the page and save your changes. Now your app will be accessible to you and your members from the navigation tab but won’t be visible on the main page.